It's possible that there's no such thing as a pleasant airplane cabin. Sure, you can mitigate the situation's suckiness, but ultimately you're sailing through the sky in a carpeted metal tube, and there's only so good that can get. There is a question of degree here, however, and a tidy airplane can make some difference. For instance, being assigned a seat that's not literally covered in feces is preferable. With that in mind, consider this list of the 10 cleanest airlines in the world. The ranking comes from Skytrax’s World Airline Awards, which recently announced the cleanest airlines of 2018. 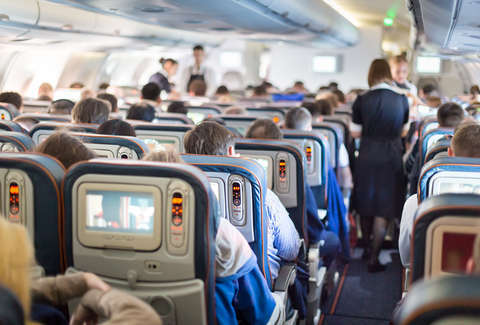 This study is based on passenger ratings for "standards and quality of cleanliness in the aircraft cabin for airlines. Cleanliness and presentation of seat areas, tables, carpets, cabin panels and washrooms all contribute towards the final results." Leading the pack is ANA All Nippon Airways. Travel & Leisure points out that this is also Japan's largest airline based on fleet size. You might have noticed that no US-based airline made the top 10, and, in fact, none made the top 30 either. Air Canada took the top prize for North America, so apparently the U.S. really struggles in the tidiness department. But at least we have the world's busiest airport?